Now we'll be taking a look at the third and final step in personal financial planning: building a financial safety net. These three financial planning steps are not meant to imply that personal financial planning is a finite exercise, but rather than a complete financial plan includes all three of these steps, each building upon and influencing the others. Once you have control over your day-to-day finances and have considered what your long-term financial goals are, you are in the prime position to build a financial safety net that can help prevent financial disasters from disrupting your financial security or goals. What is a financial safety net? A financial safety net is not one savings account or insurance policy, but rather a comprehensive portfolio of risk-reducing measures. 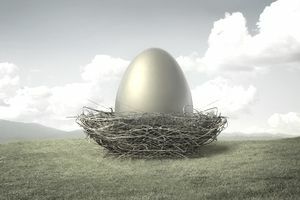 A financial safety net is meant to protect you and your family, at least in part, from losing your financial security or derailing your long-term financial goals because of some unexpected event like a catastrophic illness or other personal tragedy. Though you cannot insure against everything, nor should you try, here are some of the best and most cost-effective measures you can take to begin to build your personal financial safety net. Sometimes also known as a "rainy day" fund, an emergency fund is generally a stash of money held in a liquid savings account that is specifically set aside for unexpected events that carry some financial impact like losing your job, unexpected medical bills, or necessary, but unanticipated home or car repairs. It is the most basic piece of your financial safety net. The only objectives for this money should be that it is easily accessible in times of emergency and should help you and your family avoid high-interest credit card debt when unexpected or emergency expenses arise, which is why the money should be money that you have agreed not to touch under normal circumstances. Though the importance of an emergency fund is generally acknowledged among financial experts, there is not one universal rule for how much should be saved in such a fund. Many financial advisors suggest having enough savings in an easily accessible account to cover your living expenses for three to six months in the event of illness, job loss, or other serious emergencies. The amount you choose to plan for should be dependent on your unique circumstances like the stability of your job, whether your spouse works, and what your fixed living expenses look like. Either way, some emergency savings is better than none, so go ahead and add "save to emergency fund" to your financial goals and build the monthly savings into your budget. Long-term disability insurance helps replace your income if you are unable to work due to illness or injury. Many people consider this coverage a luxury, when in fact, it should be considered a necessity for those who don't have other financial resources they could tap in the event of a long-term illness or injury. Even if you do have other financial resources, would you want to use them to pay your monthly bills? If you saved 5% of your income each year, a 6-month disability would eat up 10 years of savings! Don't think it could happen to you? Although your chances of having a disability increase as you get older, illness and injury can happen at any age. Car accidents, sports injuries, back injuries, and disease are just a few examples. The likelihood of being disabled is far greater for most people than the likelihood of dying during a given period of time, yet millions of people carry life insurance (another important piece of your financial safety net), but not disability insurance. Consider disability insurance as insurance for your ability to generate income. Ask yourself this question: Could you and your family live without your income for three months? Hopefully, the answer is yes since you've built up that emergency fund. But what about six months? Or a year? What if you not only have to live without your income, but you also have the added expense of medical bills? If the answer is no, you should consider disability insurance. Employers often offer this coverage via a payroll deduction, which may be tax-deductible and more affordable that one-off policies through an insurance agent. Life insurance is generally a necessity for your financial safety net if you have dependents like children or a spouse who would suffer financially if you were to die. Ask yourself, what would my family do to pay the mortgage or buy groceries if I were to die? Life insurance is meant to provide the funds for your family to have some financial security should they lose your source of income due to your death. But life insurance is not only for the breadwinner of a family. If your family includes a stay-at-home parent, for instance, consider what it might cost to replace the work he or she does for the household. If that spouse were to pass away would you need to secure daycare for your children? Would you need to secure household help? Could you afford these expenses based on your current income? If you have no financial dependents, on the other hand, life insurance is probably not a necessary piece of your financial safety net, although many people also use life insurance as part of their estate planning and cash accumulation regardless of their dependent status. If you plan to buy life insurance other than term life insurance provided by your employer, you should educate yourself about the pros and cons of the term, whole life, and other types of insurance. You may also want to talk to an adviser about how much insurance is enough. The Investment FAQ website​ explains how to determine your life insurance needs. Once you've protected your income-generating ability with disability insurance, protected your dependents with life insurance, and protected your other assets by having a six-month emergency fund, your financial safety net is in place and you're ready to turn to the task of accumulating wealth.